Mother’s Day was over the last weekend and instead of getting gifts for her, we brought her to a dinner. 8 of us dined in Spaghetti Sweet Tea Cafe (SSTC), an Italian eatery at Ipoh Garden. It was my first time being there and it was just a simple dinner. Nothing fancy at all. 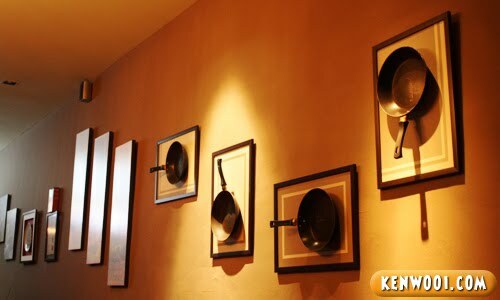 The interior design of the cafe is pretty classy and the decorations look interesting – I’ve never seen cooking pans hanging on the wall before. They have signatures on it, probably some endorsement signatures. Okay, atmosphere – good! But once I look into their food menu. So we took our time looking through the menu, and here are the food we ordered (and ate). 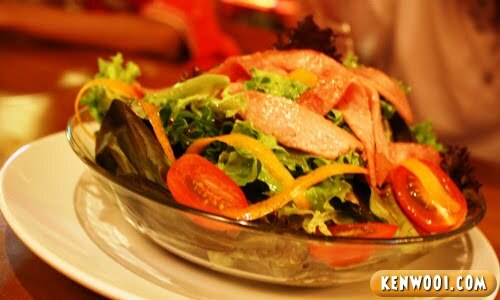 Started the meal by sharing a bowl of Sundried Tomato Salad with Turkey Ham – RM27. The bowl was kinda huge and luckily we didn’t order one for each. 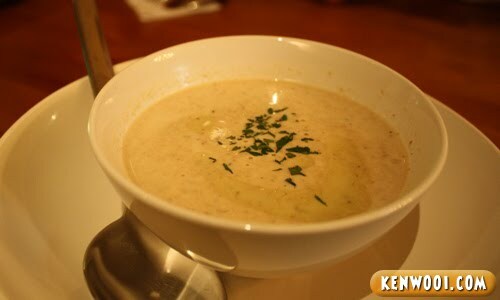 Another appetizer, Mushroom Soup – RM10. The mushroom taste is common but the texture is different from the ones we usually have in fast food restaurants (example, Pizza Hut). Then, on to the main courses. 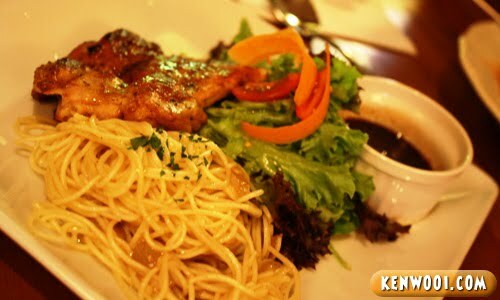 Spaghetti with Chicken Grill, the chef’s choice – RM25. 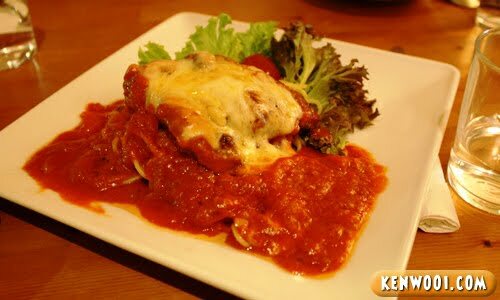 Spaghetti Chicken with Parmesan Tomato – RM30. I had this, just okay lah. It tastes good but doesn’t make me go “Wah, sibeh ho chiak! Wa ai ko ji pua!“. Okay, Hokkien lesson from kenwooi.com: It means “Wow, very delicious! I want another plate!”. 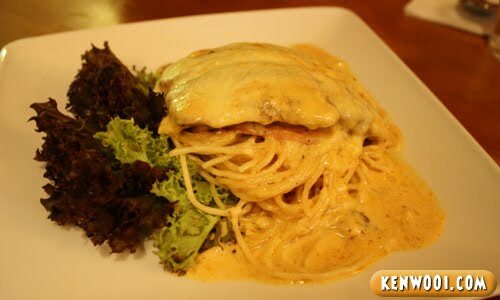 Spaghetti Dory Fish with Mozzarella White sauce – RM35. Lemon Spaghetti – RM30. No chicken or fish, just plain spaghetti with lemon. Kinda over-priced huh? 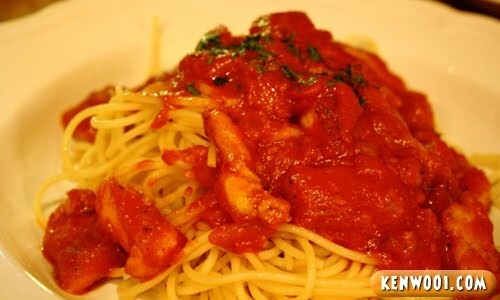 Spaghetti Chicken with Tomato sauce – RM25. 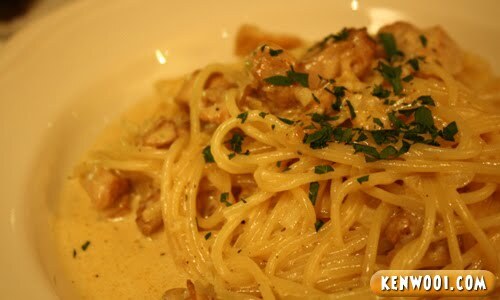 Spaghetti Chicken with with White sauce – RM25 too. 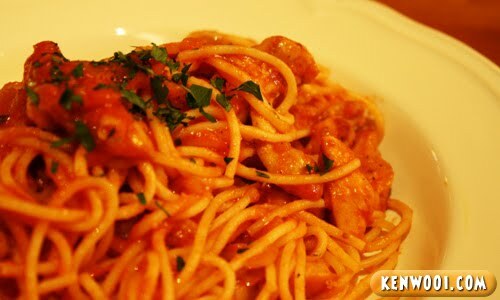 Spaghetti Dory Fish with Tomato sauce – RM30. After that, for a quick dessert – we ended the night with a slice of Tiramisu cake. Guess how much is it? Yes, really. Just for this small piece of cake. But it does taste delicious. Anyway, it was a good night I suppose, but it was “ruined” after we asked for the bill. Nahhh.. you paid RM300, at least still got change. Hahaha. I learn new things from you again today “sibeh ho chiak! Wa ai ko ji pua!”. Eh, how you add the watermark on your photos? and do you edit them before uploading? the photo seems yellowish.. Yes. Haha :D I am the FC. Anyway the salad is tad expensive. :p Aww….everything looks so saucy and delicious. I feel like you got cheated or something. Rm 18 for just a piece of cake. Crazy..
food nice! Aiyo mother’s day ma, no need bother bout money 1st lar. hehe..
but i like tiramisu is delicious! i’m not surprised with the cake price but your lemon spaghetti is totally not worth and expensive lah..
ahh.. the kuali gantung frames are really nice!! huhu..
OMG! So damn expensive lor. I can’t believe the plain spaghetti cost u around rm30. Wow..crazylah that restaurant. lol… lots of stuff ruined after the bills comes… haha! Thanks for the information, Ken.. I will pass on this one! hahahhaa… so expensive!!! Is it near the pappa rich? Have you ever been to David’s Diner in Greentown? That one not bad leh… for RM29.90, u can have a very sumptuous dinner.. Sometimes expensive don’t mean is good or delicious too eat. This also refer to cheap food. Anyway nice info for the menu. Waw~ nearly 300 bucks. So expensive. ipoh garden? which part ya kenwooi? I would say, ‘once in a blue moon’ u would go there..Tooo expensive! Hey bro, The Spaghetti Chicken with Parmesan Tomato looks good, good looks doesn’t always taste good, right? 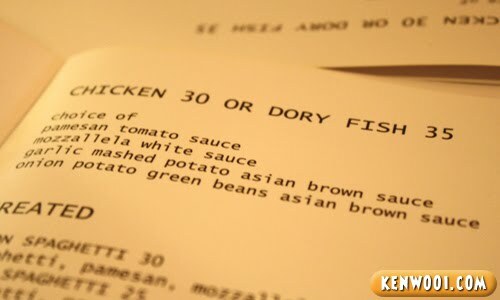 RM 30 for the Lemon Spaghetti is seriously over priced, the lemons must be from Madagascar or something to be so clostly. I guess better just stick to Chili’s right? Im’ Never, Ever going to some place that serves that kinda food at that price. whatudo, otherwise mummy Tar Pet Pet. 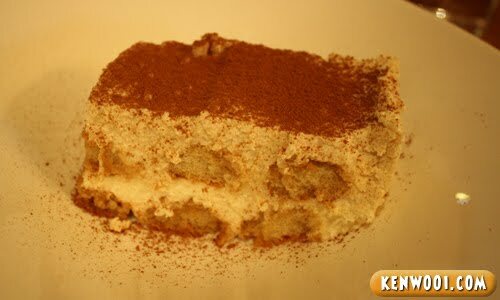 I teach you how to cook Italian food and make tiramisu, next yr u can cook for your mummy. Save money lo! Eventhough i am ultimate cake lover, i wouldnt pay RM18 for a pcs of tiny cake.. Seeing the price, I don’t think I can afford it now to belanja my mom dinner for Mother’s Day. Later in the future, when I’m working I’ll definitely bring her somewhere nice. Hahaha. Wow you wanna another plate the food must be ho ho chak. Guess nice ambience, yummy food, great company, lovely special Mother’s day should overshadow the not so nice bill$. But on the overall for 8 pax it is still OK as long as happy will do. ~;) tQ. except for the lemon spaghetti, others really make me drooling!! but they’re way too pricey. 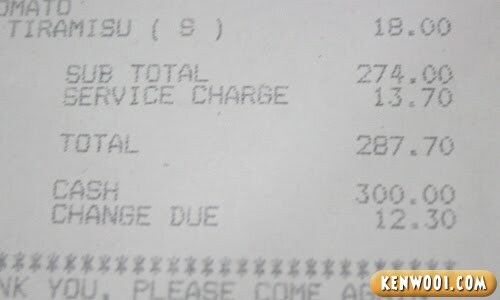 mahal nya……… ishk… leh makan reramai tu…..
Wah Ipoh restaurants are starting to charge like KL restaurants man! Money sucker :P Somemore the lemon spaghetti really looked plain! If I were you, I would have complained to the manager.. RM30 for plain spaghetti?? Wow, so high priced, even by KL standards. For that price, you can try Italia Mia … Tiramisu for RM19.50, but darn good. And you can get decent chops, (pork included) pastas, and of course, desserts there. wow expensive! but they look delicious! the spaghetti so tempted and the price as well. wow.. seriously over-priced.. especially the plain Lemon Spaghetti..
a slice of cake costs RM18..the most expnsv i had was ~RM15.90 lolx and tat was after conversion frm S$! kinda expensive for that kind of food presentation. btw ken, u going to the laugh fest? wah really expensive wei.. the cake alone is RM18 wtf! such small piece!! RM300/8? I should say cheap! It would be better if you can cook lah! With joy, care and tender loving! Wow! Really overpriced! And it’s not even in KL!! They have the nerve to charge such high prices! Actually what’s so expensive about a plate of spaghetti? We can make our own for less than RM5. Imagine the high profit margin the restaurant is making! Gosh!! OMG!! 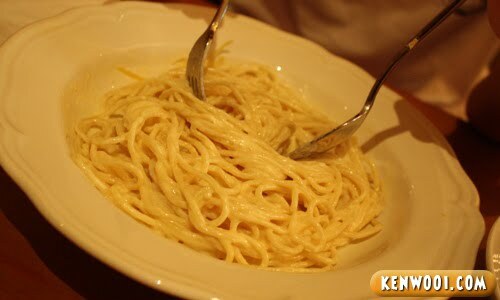 Plain lemon spaghetti for RM30! You must be kidding me! I wouldn’t have ordered this!! I think the lemon spaghetti you can nmake your own at less than RM3!!! Happy Mother’s Day! Happy day to your mother but not so happy to those of you who are paying. Haha!! Wah.. so expensive, i don’t want to go there..
u go so many place around ipoh..
What’s the name of that cafe again…$$TC? u must be damn rich!! so exp leh.. really fine dining, but didnt expect Ipoh got such nice place to eat. I thot mostly in KL.. So yummy !! my fav italian !! but at ipoh right? yum yum! Mother’s day = Money’s day! Same goes to Father’s Day (which is around the corner)! Happy belated mother’s day! Wow! lemon spaghetti? should I try this! The boss initially wanted to run their restaurant in KL. 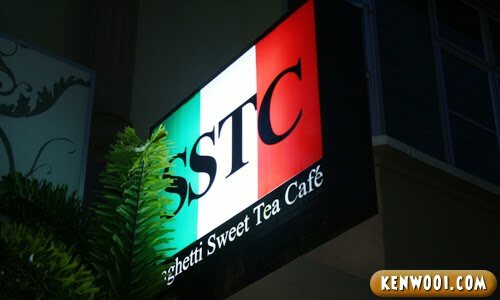 They operate SSTC in Ipoh because they see Ipoh has lesser Italian restaurant compared to KL. Thus they see a good chance running them in Ipoh thus Ipoh-lang no need go down to KL for Italian fine dining. Nice food…..and a good son! walaueh, the restaurant ki siao 1.
well, i think people shouldnt go to this restaurant la…seems classy and all but the spelling of the names of the cheese is wrong…so weird and ridiculous!!! Never mind, once a year only… main thing is your mother enjoys it lah. A dinner at Italia Mia over at Sunway also will cost as much, if not more. But personally, I like Italia Mia more than SSTC, though the lady serving us at SSTC was very friendly. Some creations of theirs are really out of the box, the spaghetti pizza for one. But did not work wonders, sadly.